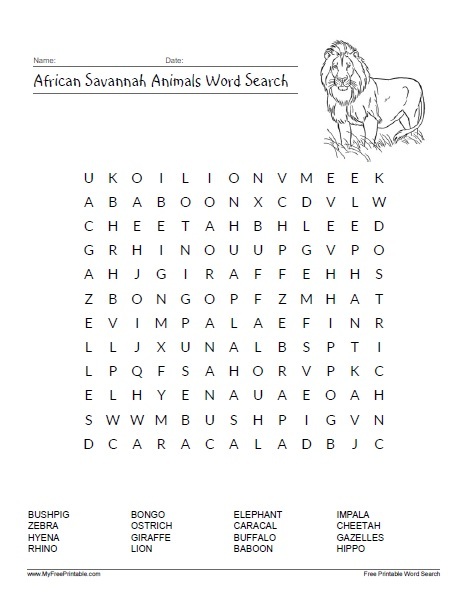 Download Free Printable African Savannah Animals Word Search. Print this Savannah Animals Word Search and share with your students at school. A fun activity for the classroom and homeschool. Also you can share with your kids at home for a fun educational activity. This easy to print puzzle contains 16 African Savannah Animals. Find African Savannah Animals names like Lion, Elephant, Rhino, Giraffe, Cheetah, Hippo, Baboon, Zebra, Gazelles, Hyena, Ostrich, Bongo, Buffalo and many more. Click the link below to download or print the African Savannah Animals Word Search puzzle now in PDF format. Instructions: Click the print link to open a new window in your browser with the PDF file. Then you can print or save using your browser’s menu.